On the left of this photo taken in PTE days in December 1977 is the last operational ex Todmorden JOC PD2, as Halifax 356 which had been a Driver Training bus since withdrawal from passenger service. 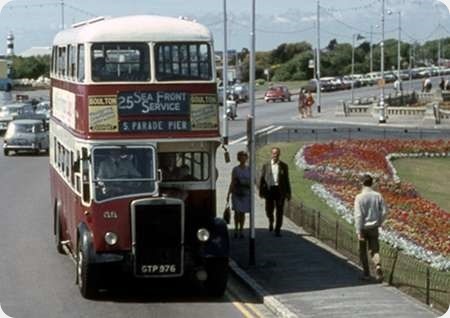 On the right is its replacement – ex Halifax 279, a 1965 Roe bodied Leyland PD2/37. This is in its new guise as Driver Training bus T7. By this date the PTE had introduced a dedicated training bus livery. 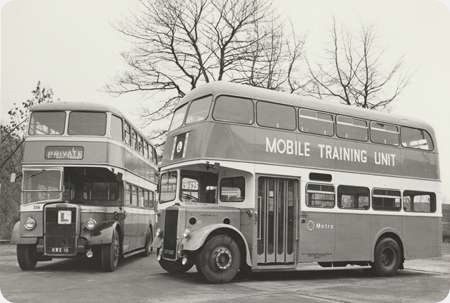 T7 was later sold to a driving school in the West Midlands. 356 was put on one side for preservation but was eventually scrapped as a lost cause, a sad loss considering what can be achieved nowadays. The heaters on Halifax MCW PD2s were very good for about a year. Being under the seats at floor level they sucked in lots of dust which blocked the warm air flow. It was a long job to clean them out. Just blowing the dust out with an air line covered the saloons in dust. The cleaning job was also unhealthy so nobody would do it. The old round Clayton heaters being fitted well above floor level didn’t gather much dust and remained in working order much longer. At Blackburn we used to place wet sacks over the heater unit to catch the dust when blowing it out with an airline, this was not ideal but kept some heat in the saloon during winter! The 1965 Roe bodied Leyland PD2s & the CCP registered Park Royal bodied Regent IIIs are my all time favourite Halifax D/Ds, its a great pity that no examples of either type are in running order in the UK. I did see a former Halifax Roe bodied PD2 still in its Metro training bus guise at Winkleigh a few years ago, but I could not tell which one it was. Another of the Roe bodied PD2s number 62 was put back in full Halifax green, orange & cream attire, but it did not spend long in preservation & it was exported to either the USA or Canada in the early 1980s. Does it still exist? In 1974 my wife worked in the personnel dept. of the then newly formed West Yorkshire Metropolitan Transport Executive. She, they had to send a memo out to Ex Tod crews that taking their buses home at lunchtime was no longer permissible. Wonderful story, Geoff. Big business versus small business destroying the personal touch, as ever! The 1965 Roe bodied Leyland PD2s of Halifax were wonderful buses, very solid in the best Roe tradition. It is interesting to relate that a very similar batch of buses were supplied to Ashton Under Lyne in the same year & two years later Lincoln received a batch. Lincoln had received two batches of Roe bodied Atlanteans in 1964/5 & then reverted to PDs in 1967. I would say these Roe bodied PD2s were my favourite double deckers, the longer HBU registered Oldham Corporation Roe bodied PD3s of 1964 were also firm favourites, sadly one was lost when it turned over on a roundabout in Rochdale in 1967. The Oldham bus which turned over was 108 HBU. It turned over in Oldham, at the bottom of West Street, after being hit by a tanker, not in Rochdale. It was operating the Rochdale to Ashton service 9. 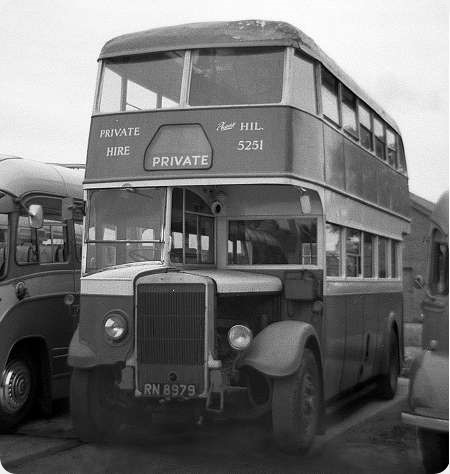 I drove a number of these Roe bodied PD2s whilst at Halifax when they were new, and I agree that they were in a greatly superior class to their Weymann contemporaries, except in one particular. Being a quite long legged specimen, I found that the drivers’ seats on the Roe bodies did not go back as far as those on the Weymann examples, making them less comfortable to drive. I know that Mr. Hilditch was, shall we say, a traditionalist in his views and requirements but why did he specify holes in the bonnet sides on these vehicles? It seems like a throwback to the 1940s, did they serve any practical purpose? GGH inherited this order from the previous (Leyland besotted) GM, Richard le Fevre, who, despite being on the verge of retirement, chose to saddle his successor with his Leyland legacy. Because of the extended strike at Weymann, where some of these PD2s were heled up for months, Geoffrey Hilditch managed to divert those chassis that were still accessible to Roe for bodying. The apertures in the bonnet were for access to the oil filler cap and dipstick, and this was a Leyland option that appeared on all the Halifax PD2s and PD3s. Believe me those holes are invaluable for oil checking. I have a couple of vehicles with solid sides and they are a pain. In service you needed conscientious mechanics to avoid engine seizures.